These are my 3 kids. Zack, Dillon and Shawn. 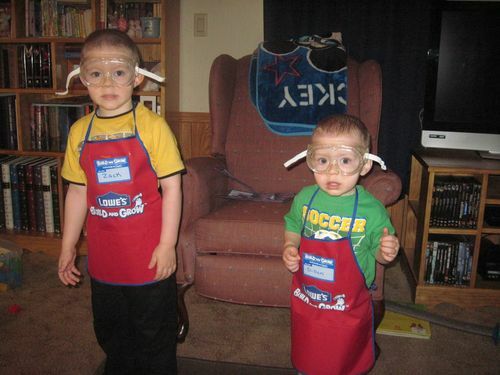 First picure is Zack and Dillon wearing their tool aprons and goggles. 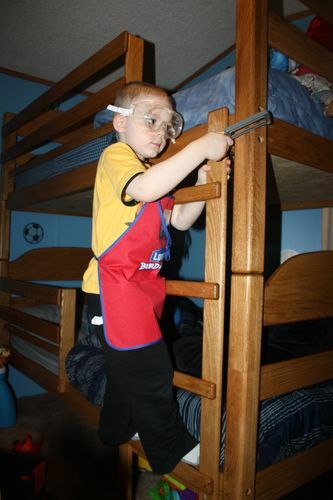 Second picure is Zack making some adjustments to the bunk beds I built them for Christmas this past year. 3rd picture is Dillon with his drill. 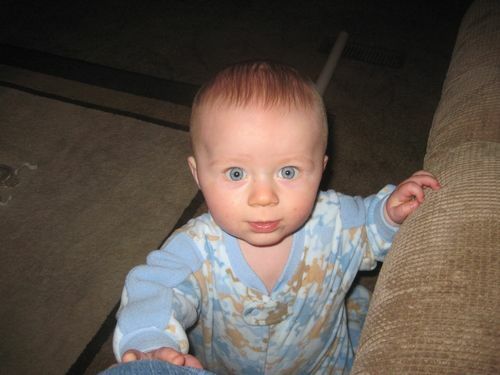 Fourth picture is Shawn, I don’t have an apron and goggles for him yet. I see you are teaching them “Safety First” with those goggles. We can see you’ve taken them to play at Lowes. My kids have a blast going there as well. It looks like plenty of woodworkers live at your house Kevin. Thanks for the comments, it is so nice that Lowes does that for the kids. I hope they stay interested in woodworking as they grow up and safety too. 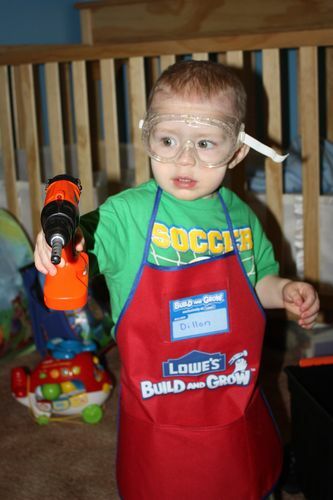 Kevin – you are right, it is never too early to get them started in the shop. My grandkids are building projects starting just short of 3 yrs old with scrap blocks, a hot glue gun, and some markers. I don’t really direct them to build anything, I let the “empty box effect” take over. That is, I let their imagination run wild with the scrap blocks of wood. As they get older their project become more sophisticated on their own and I know we will build something with a more structured atmosphere in the future. Kevin, You are so bleesed with those 3 boys! They look like they are all about woodworking. Thanks everyone, the boys already show great creativity I can’t wait to see what they are capable of when they are older.